A tedious task facing Electricians during project fit-out is the creation of numerous holes in wall linings for connection of power outlets and light switches. The opening must be rectangular, accurately positioned and not vary too far from optimum dimensions. Marking out can be taxing and time consuming and often suffers from being delegated to an apprentice. The Blue Monkey template level has a positive impact on the performance of this task saving time (which, on site, means money). It speeds up mark out operations, improves accuracy and reduces rework on a task that may be repeated hundreds of times on a project. 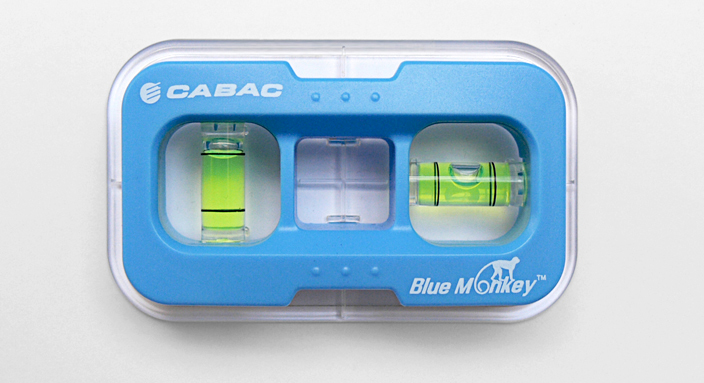 The Blue Monkey template level exploits the injection moulding process to the maximum, to eliminate subsequent manufacturing operations and minimise assembly time. Using integral moulded assembly features, it avoids screws and eliminates a previously required gluing operation. Assembly can be performed top-down so that each component is only handled once.